Other people probably much more able-worded than me have written about the joy of gardening. Here’s my humble current rumination on this topic. You can’t keep my hands out of the dirt. About a year ago, I found myself at the Lindberg Pike Nursery crying among the flower pots. I was there to find zinnias and other easy growers for my summer garden, believing that it was my fate to put them in the ground and not be able to enjoy them. My house had been put up for sale. I had bought another house in Florida with my then-fiancé, we were in the process of moving, and it was my lot in life to pretty up my home in Atlanta for what I thought would be the next buyer. When I got to Florida, I learned that the neighborhood had strict covenants about gardening. Basically I would not be allowed to change anything in my garden without prior approval from the community. I thought that was totally ridiculous, and meant that I could not put in an herb garden or grow tomatoes in the sunshine unless my plans got run through a group of people I had never met and probably with whom I did not share the same vision. For the prior 17 years, I had done whatever I wanted with my all-organic garden, which had worked out rather well for me as well as the butterflies, hummingbirds, songbirds and bees. 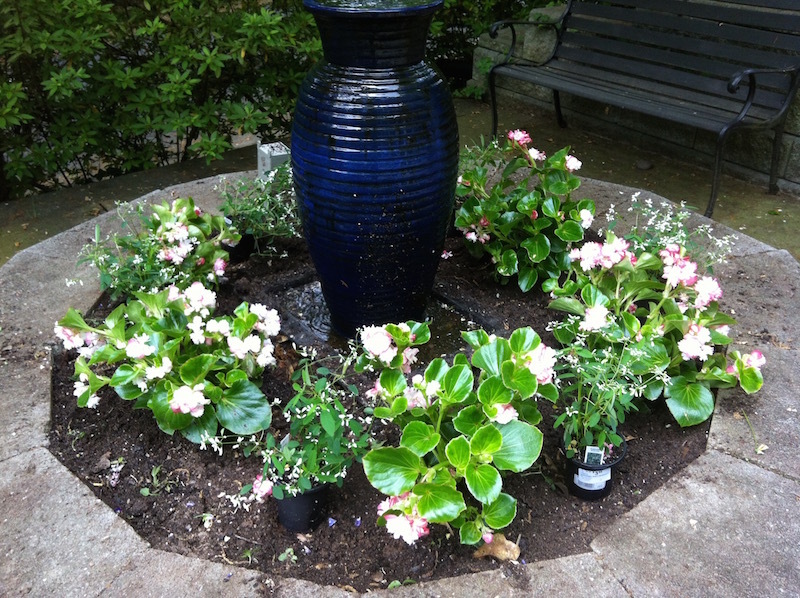 Arrangement of double begonias and euphorbia in a previous spring before planting. 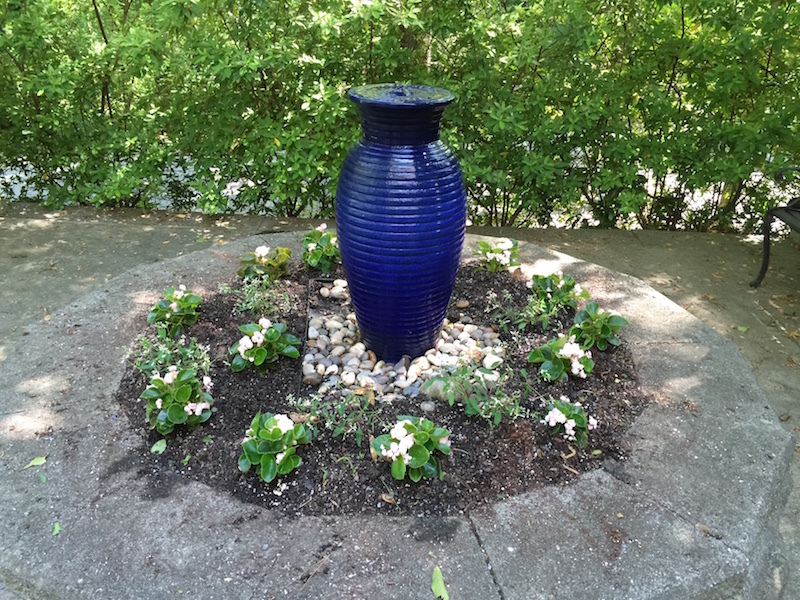 One of my spring rituals is to search for double begonias and euphorbia to plant around the blue jar fountain outside my studio where I work. For those readers who are not desperately devoted gardeners, double begonias are actually a bit hard to find. One year I couldn’t find any at all until I visited a friend’s garden. 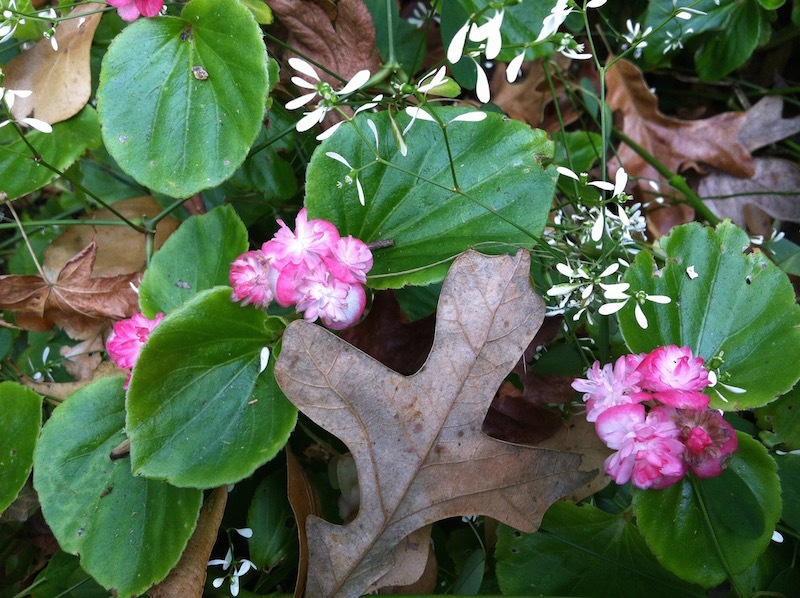 There they were – my double begonias, only they were blooming in her garden, not mine! Another year the only ones I could find were a single hanging pot. I bought the pot and carefully divided the roots. But a few months later, the result was utterly glorious. When I was in Florida, I resolved to help myself feel normal. I went to an orchid farm just north of Tampa and purchased about 10 orchids for the porch in addition to the ones I had brought down from my studio in Atlanta. The gentleman at the orchid house must have sensed my ennui as he spent two and a half hours walking me through each and every one of his greenhouses discussing the finer points of raising paphiopedilums, phalaeonopsis, cattleyas and oncidiums. Meanwhile, I was driving back and forth between Atlanta and Florida. I absolutely hated the eight-hour nonstop drive, which could eventually stretch to 10 hours or longer if my tire blew out, as one of them did, or if I couldn’t take it any longer and had to stop to eat or nurture my 13-year-old dog Belle who was riding shotgun with me. The visits back to Atlanta gave me time to appreciate the zinnias I had planted and all the butterflies they attracted. While enjoying my garden, which is one of the great true loves of my life, I recognized that I did not want to marry my fiancé. When I moved back to my beloved home in December, I resolved that they will have to take me out of this place in a pine box. I simply refuse to leave my garden. By fall 2015 I knew I wanted to return to Atlanta. As a gardener, you spend time studying everything about your own little plot of land. Where the best soil is. What you need to do to improve the soil. 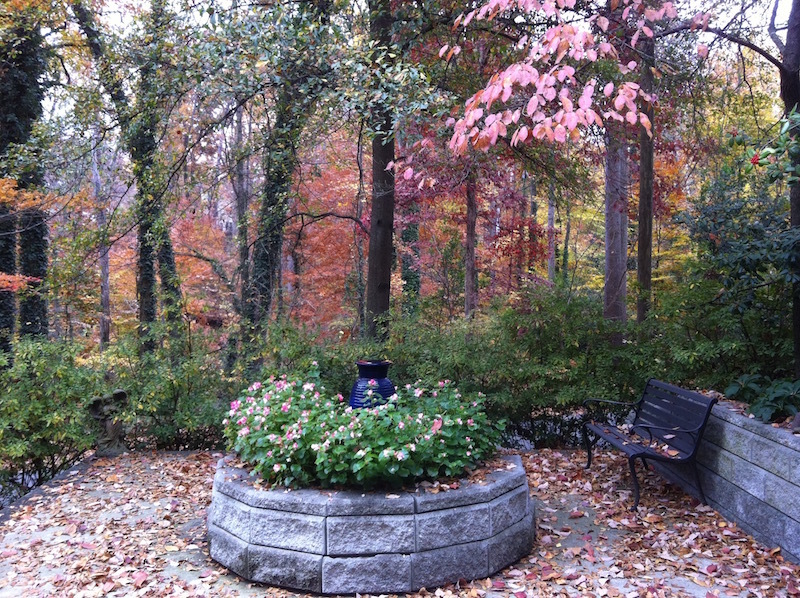 How an overgrowth of trees can affect the rest of the garden. 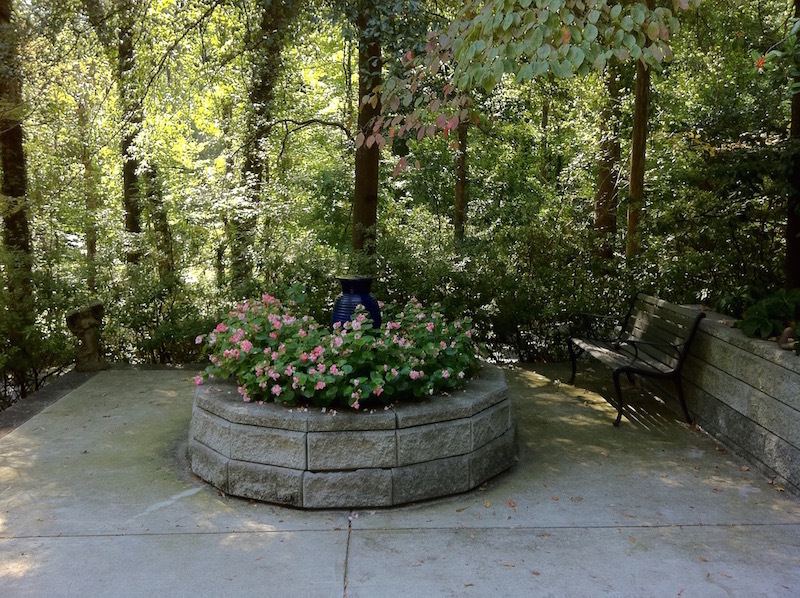 At times, I can feel like a veritable horticultural genius, thinking I have it all worked out as the petunias drape over the back wall like a Kentucky Derby winner’s blanket and the tomatoes grow wild and the begonias grow waist high around my fountain. And then the next year not so much, as everything changes, depending on the rain, how cold the winter gets, when it’s finally warm enough to plant and a million other details that as the owner and caretaker of your very own garden you attend to so thoughtfully. As I was standing at the Lindbergh Pike Nursery yesterday, I was delighted to find not just one kind of double begonia but several. I could hardly believe my luck! I was standing there so long, looking at this apricot colored double begonia, putting one back, picking up another double begonia – a pink one this time – that several Pike garden assistants came over to assist me, clearly noting my personal distress. You can buy a rug and it can lie on the floor of your house for decades. With gardening, you have to think about this year, this weather, this soil, right now and the few months stretching ahead. “Do you need help?” one very friendly Pike gentleman asked me. I had come to enjoy, anticipate and revere my collection of double begonias and euphorbia so much over the years that I did not want to make a mistake this year! Finally, I settled on delicate pink begonias. They looked small when I finally put them in the ground next to the euphorbia, but I already know that within a few months they will be bounding upwards in the glorious place that is my side garden, watered naturally by the blue jar fountain and admired by me every day and by all the clients who visit my studio. I tied my dog Belle to the bench next to the fountain as I dug in the dirt so that she too could participate in the spring planting. What a ceremony it is to put flowers in the ground, mounding the dirt around them, hand watering them carefully and waiting for what is surely to come!